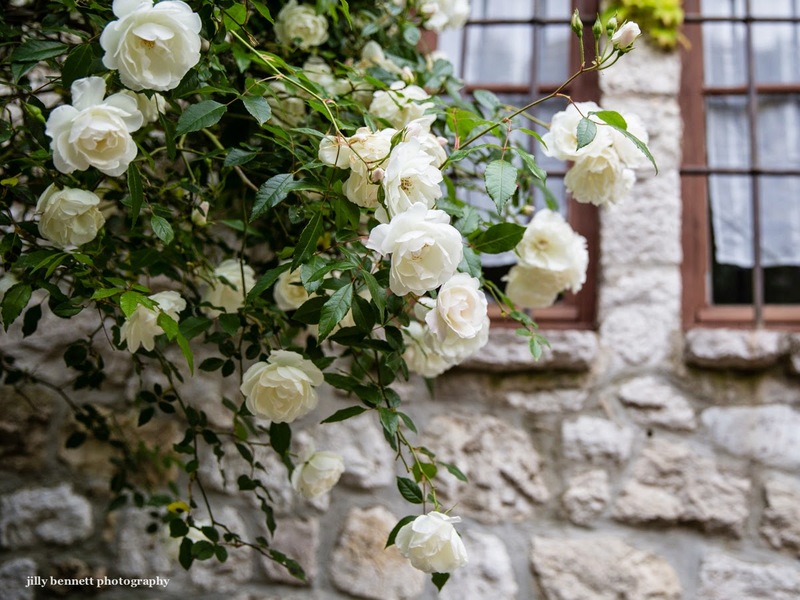 White roses in Eze village. A pretty corner in Eze village. It is named after Francis Blanche (1921-1974) who was an actor, author and apparently the first person to hoax people by telephone - something he did on a radio show. 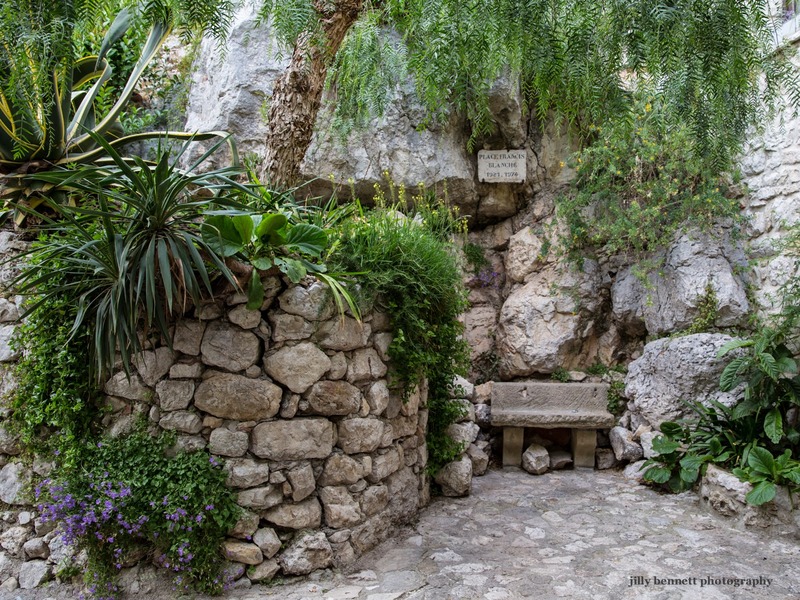 He is buried in Eze. 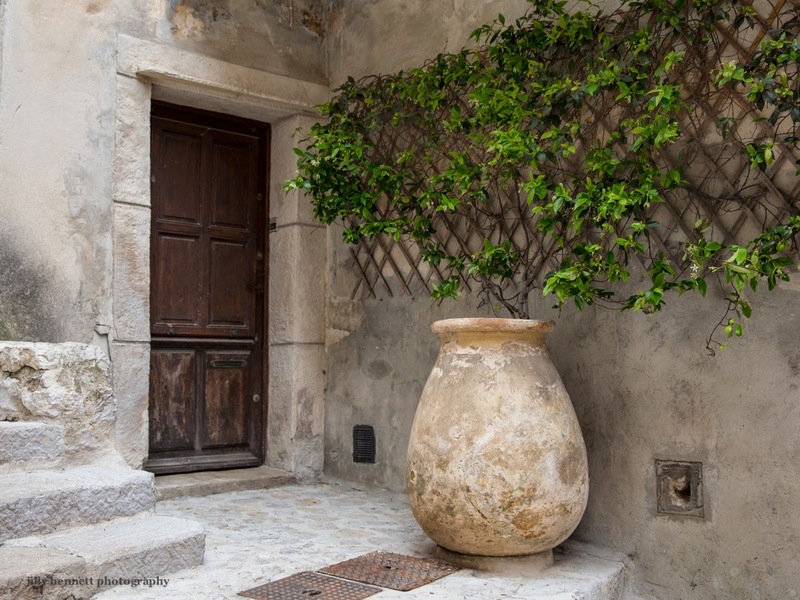 Beautiful old pot outside a house in Eze village. The climber is Trachelospermum jasminoides, a native of south east Asia that you often see in the south of France. It's common name is Star Jasmine. There I was photographing the German Shepherd and somehow the young lovers crept into the photo. 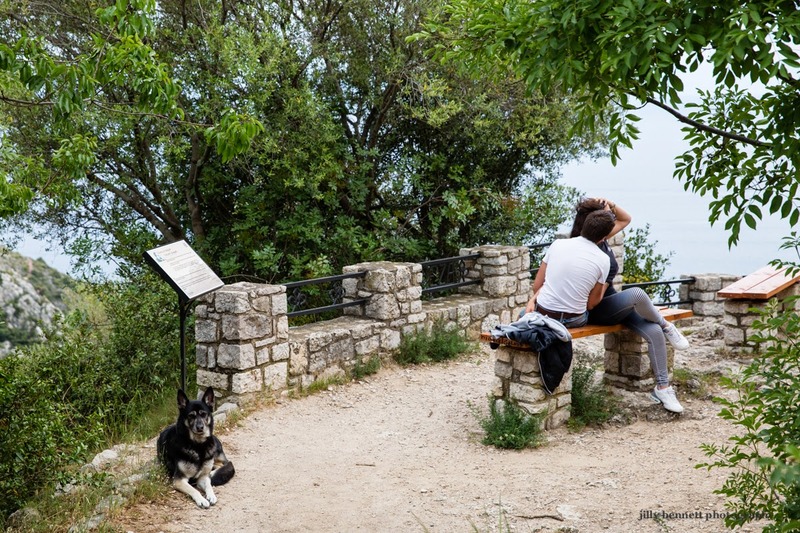 The bench is on the Sentier Nietsche - this is the walk that goes from Eze village way down the hillside to Eze Bord de Mer. The beautiful German Shepherd is Roxanne and she's 8 years old. You can see a close up of Roxanne at Riviera Dogs. Here are some of the smaller tables at the beautiful Mas Provençal at Eze. 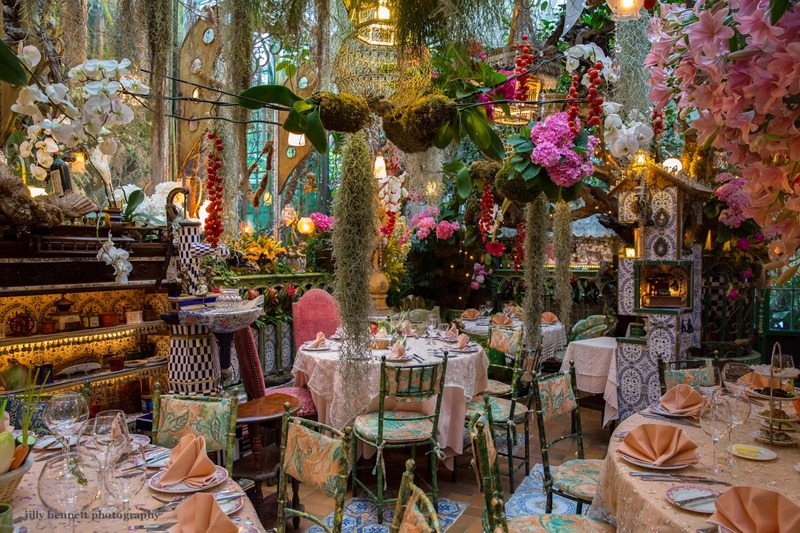 You enter a world of flowers when you go to the beautiful Mas Provençal in Eze village. 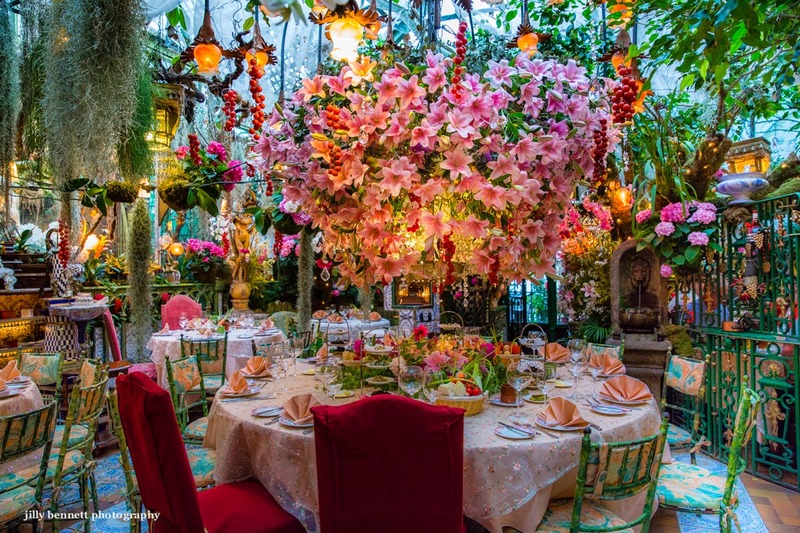 I was invited to dine there yesterday by my dear friend Lynn Espie. She and her delightful granddaughter, Aimée are over from New Zealand, where Lynn will judge next weekend at the Euro-OES-Show near Lyon. For those who don't know, OES stands for Old English Sheepdogs - the breed I used to breed, show and judge. Thanks dear Lynn for a fabulous fabulous evening. What a great time we had. Love you! 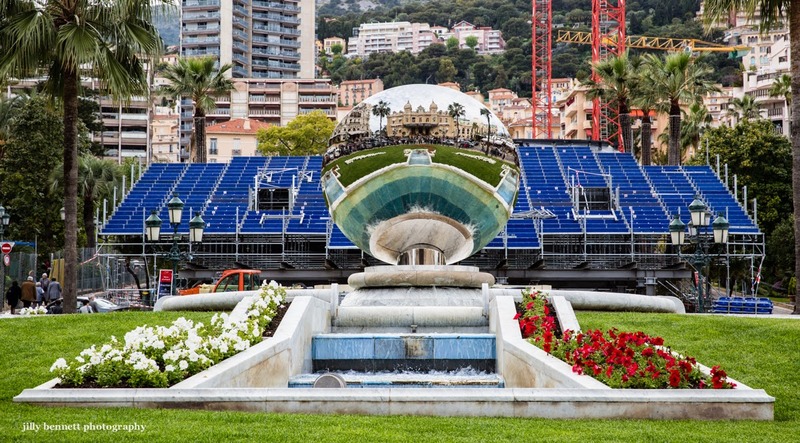 If you are in Monaco today - Grand Prix time! - this is one of the places from which you might decide to watch the race. We're in Casino Square - the cars whizz up from the port, past where you are sitting and on down to the hair-pin bends of Loew's Casino. The concave/convex mirror is called Sky Mirror by Anish Kapoor and is reflecting the casino building. Monaco Grand Prix this weekend! 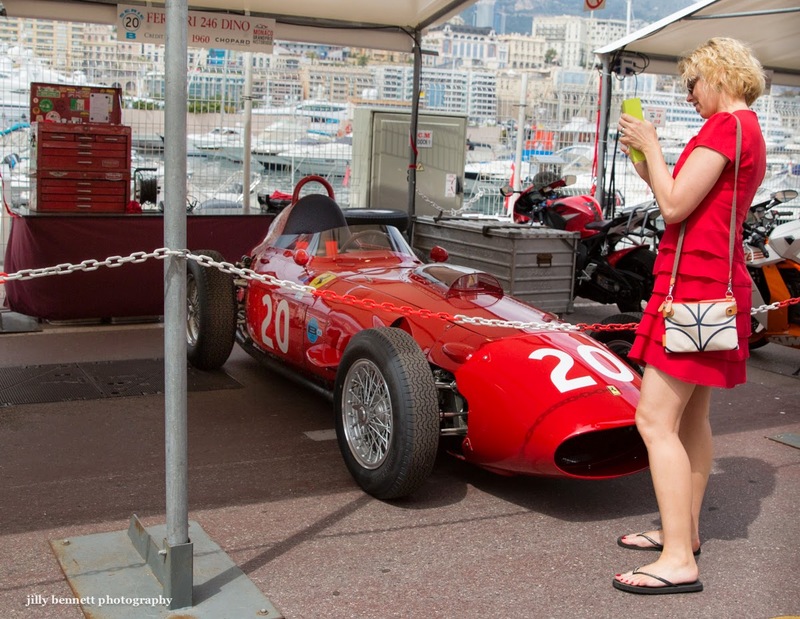 Well obviously this Ferrari 246 isn't taking part but it did two weeks ago at the Monaco Historic Grand Prix when it was placed 5th in its class. It's owned by Tony Smith, manager of Genesis. This car is one of five produced in 1960 and was driven by Phil Hill. Another claim to fame is that this was the last model of Ferrari before the rear engines came in following the success of the Coopers. "I haven't yet met a woman who told me, 'I wish I had shorter legs.' 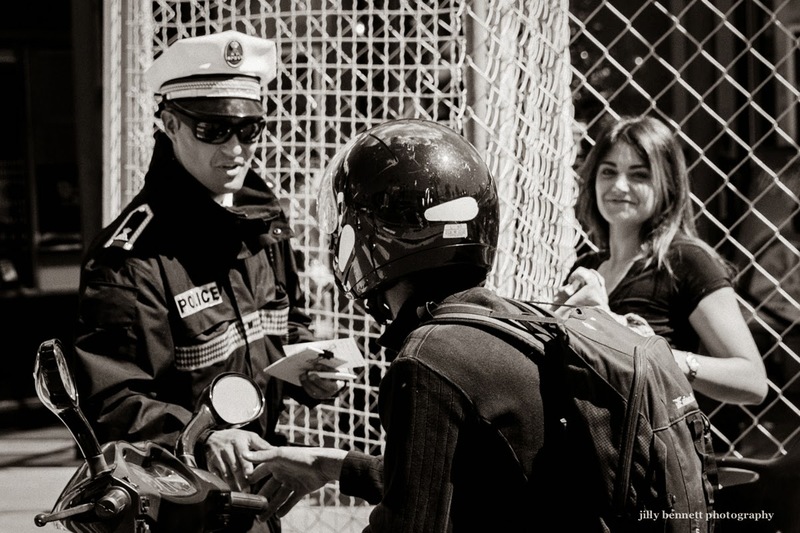 "
Monaco policemen are friendly ... and good looking! 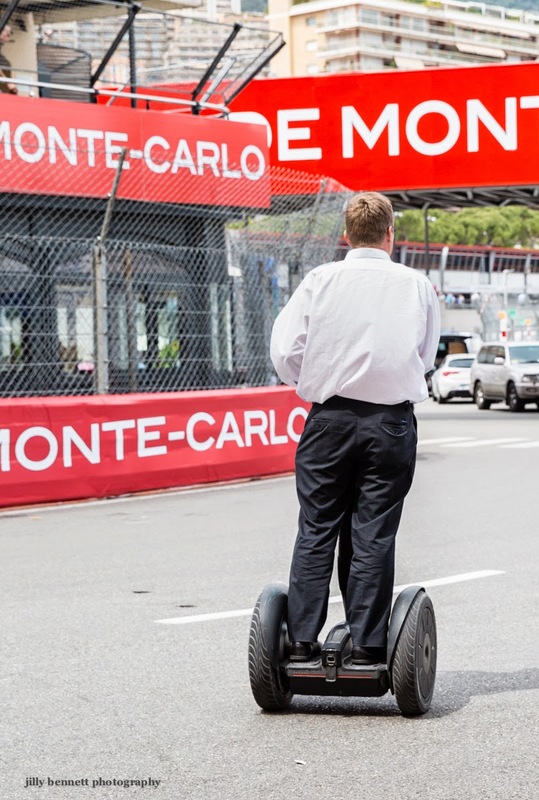 This looks a good way to get around Port Hercule at Grand Prix time. 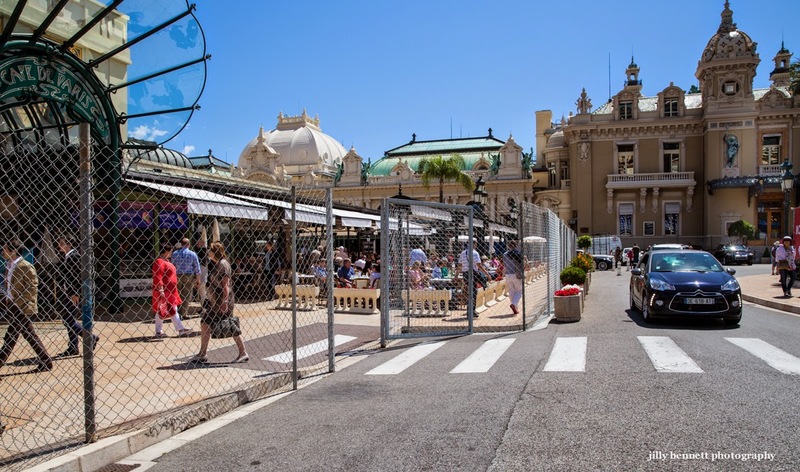 Even the Casino is fenced off at Grand Prix time. 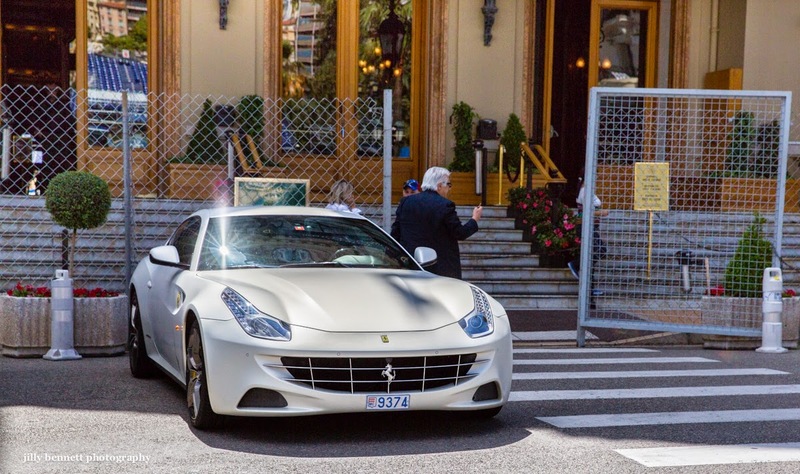 Of course it doesn't stop the obligatory Ferrari being parked in front of its doors. Almost Monaco Grand Prix time - next weekend. And so Monaco is encased in its ring of steel. Here the Cafe de Paris on the left and the Casino in the distance are fenced in with gates for people to walk through. The shiny silver Bentley we saw yesterday reflected everything! 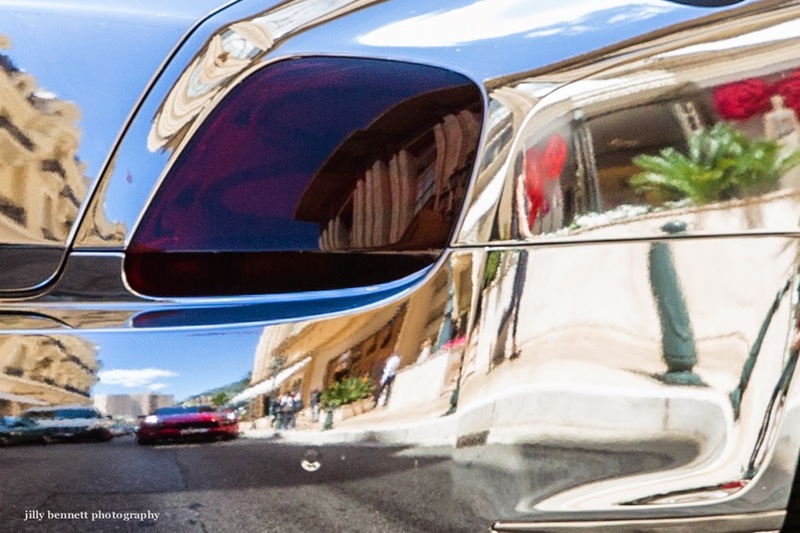 Pulling away from the Louis Vuitton shop is this shiny silver Bentley. Is it stainless steel? 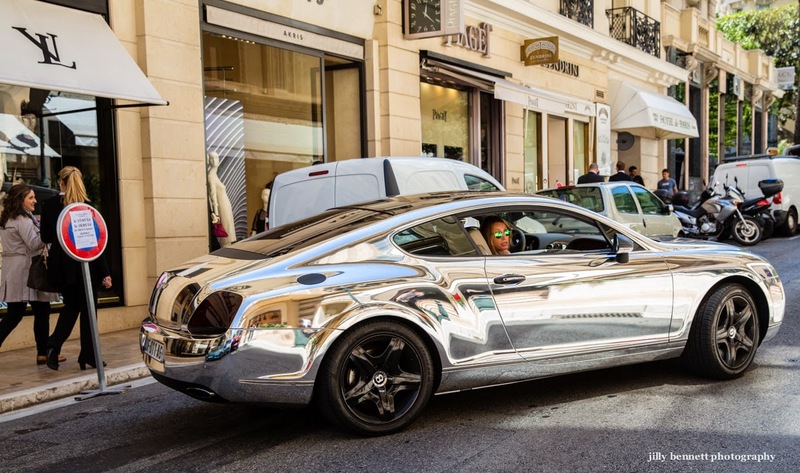 I've never seen a car as shiny as this ...talk about bling! 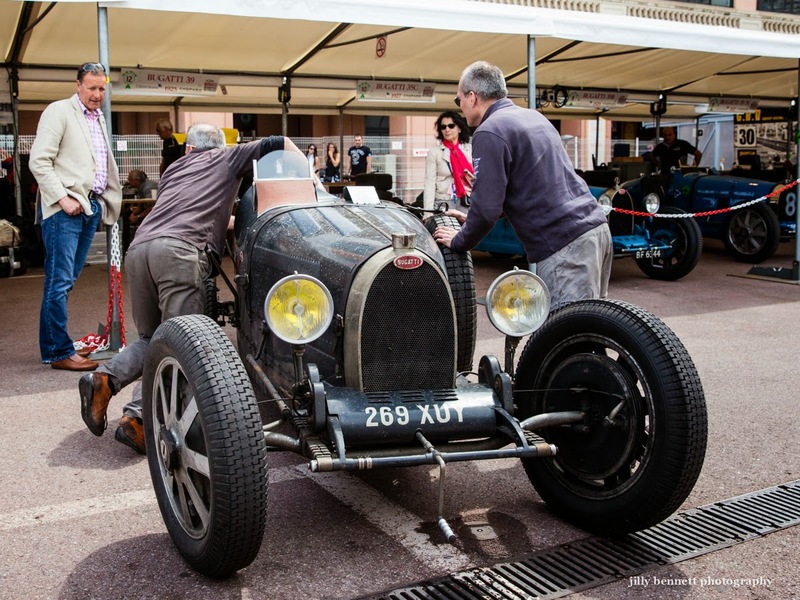 Grand Prix Historique de Monaco - the Oldest Lady Bugatti and Dirty too! 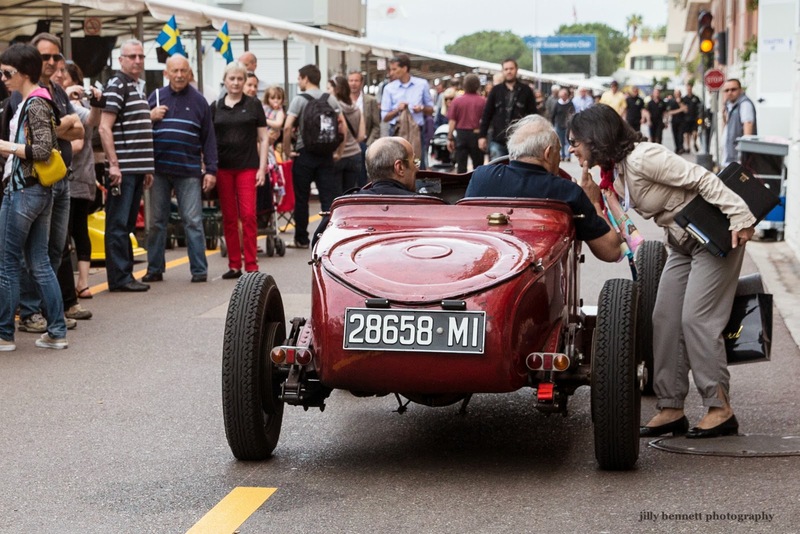 This is the oldest car at the Monaco Historic Grand Prix. And she's dirty! I love that ... not for her an arrival in a van with mechanics alongside - she was driven here! She's a Bugatti 39 - born in 1925 - which makes her pretty much 90 years old. Isn't she a beauty! 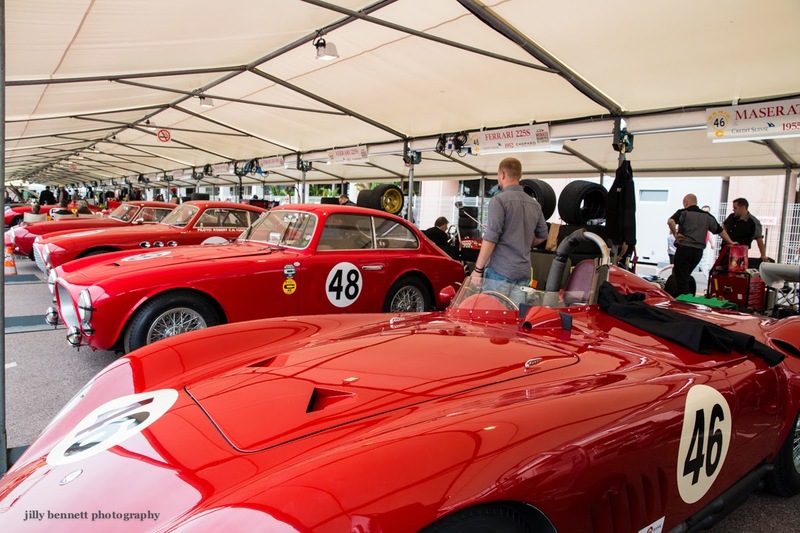 Each car at the Historic Grand Prix of Monaco has to undergo a rigorous safety examination before racing. These guys work for the ACM (Automobile Club of Monaco) and are inspecting a 1972 BRM P180 in Marlboro livery. 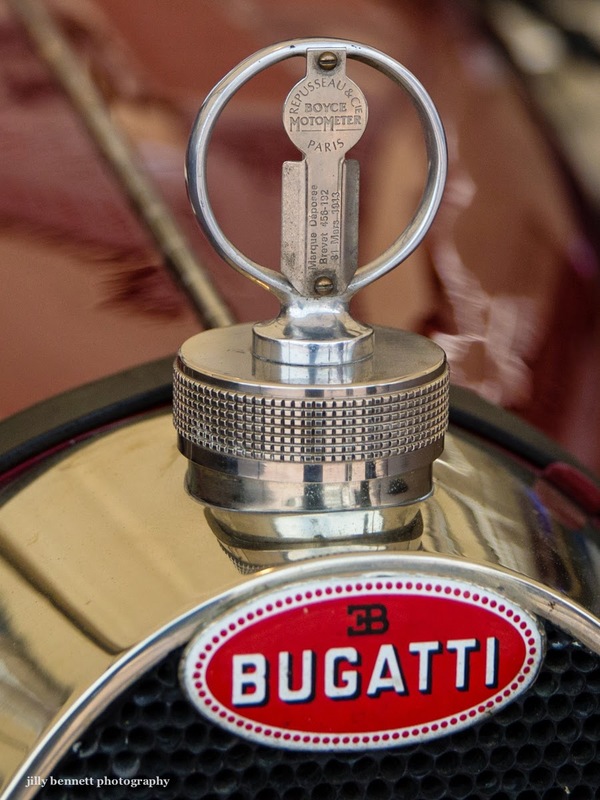 A detail from the 1926 Bugatti 35 at the Monaco Historic Grand Prix. This is the Alfa-Romeo Tipo B (P3) made in 1934 - it won the A class race. What a beauty! Clouds hung low over the Principality on Thursday but it didn't detract from the beauty of the cars. 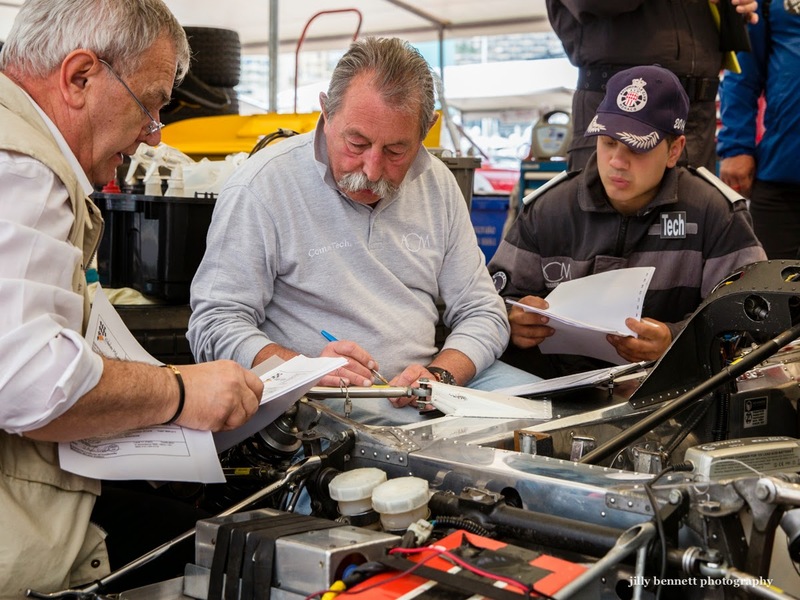 And always such a great atmosphere at the 'historique' with everyone happy to chat, mechanics and owners alike. Red! Mostly Ferraris from the 1950s although the car in the foreground is a Maserati. 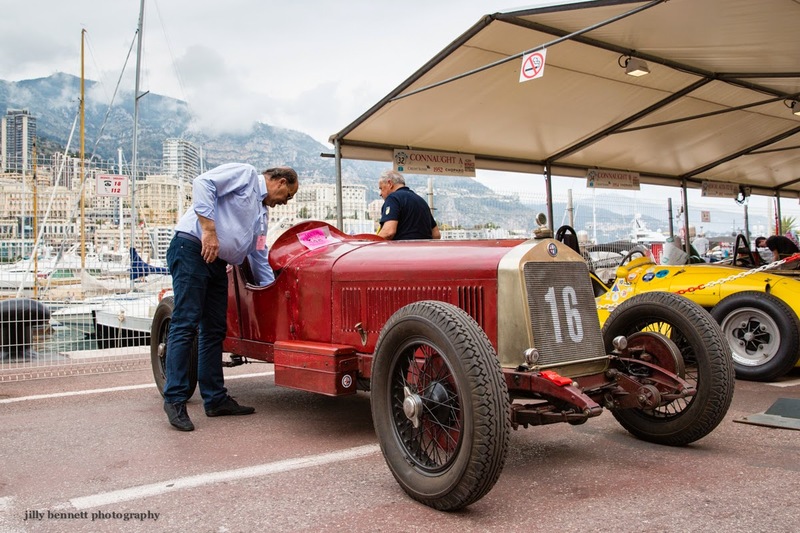 The Historique Grand Prix of Monaco is held every second year and even if you know nothing about cars - like me - it's the best fun and a joy to look at these beautiful old cars. There are Bugattis going back to the 1920s, ancient Alpha Romeos and so on. I was there last Thursday. Most cars had arrived but there were still a few, like this one, just driving in to the paddock area to admiring glances. 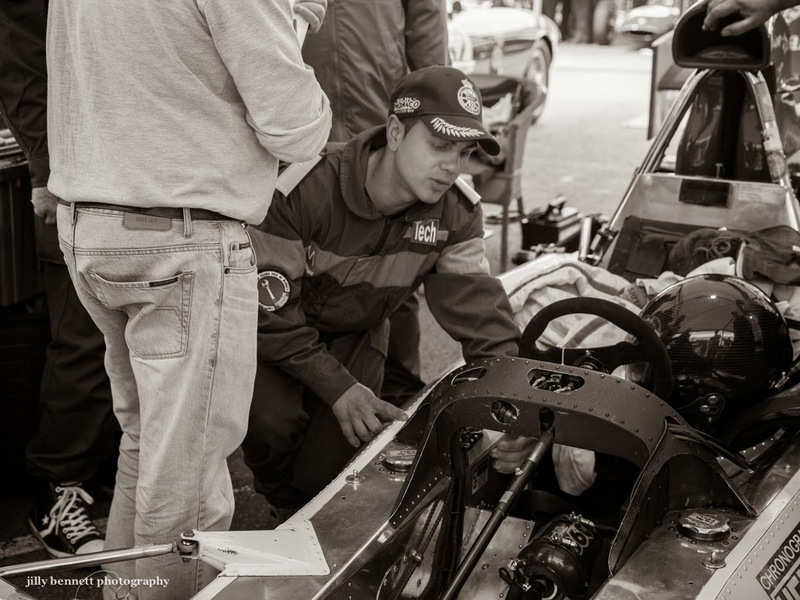 The majority of cars arrive in large trucks, along with a couple of mechanics to tend to their every need. These old cars are exceedingly valuable. Mostly, I noted the name and year of the cars for you but I didn't follow this one to its parking place, so I don't know. Perhaps someone will tell me? The majority of cars had one seat only, so this one confused me! 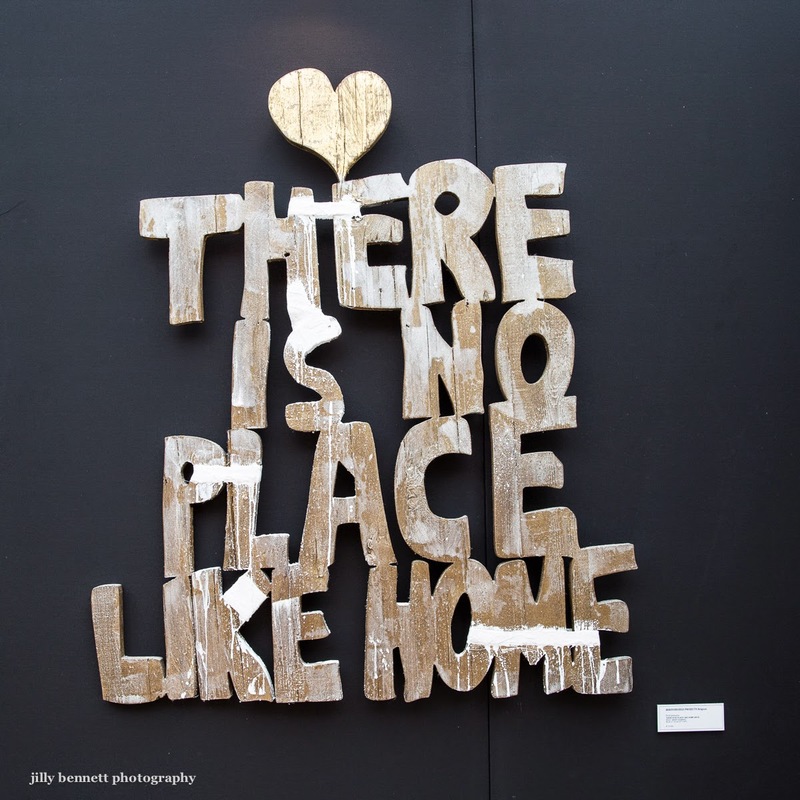 Belgian artist Dirk Janssens created this sculpture from wood and plaster. He is represented by Irrreversible Mag and the lovely lady we met yesterday. Click on the link to see and read about Dirk's work and his many awards. 'In his art Dirk Janssens explores the positive and emotional aspects of the basic concept of being human. His work is a tribute to life and love, purely instinctive, in a completely unique language. His works are an investigative transformation; it is far from arbitrary, and represents a willful, passionate craving for almost unattainable and utopian Love. At the same time, this art offers comfort, as it fires an enthusiasm for life and inspiration; in fact it’s a tireless courting of passion itself. 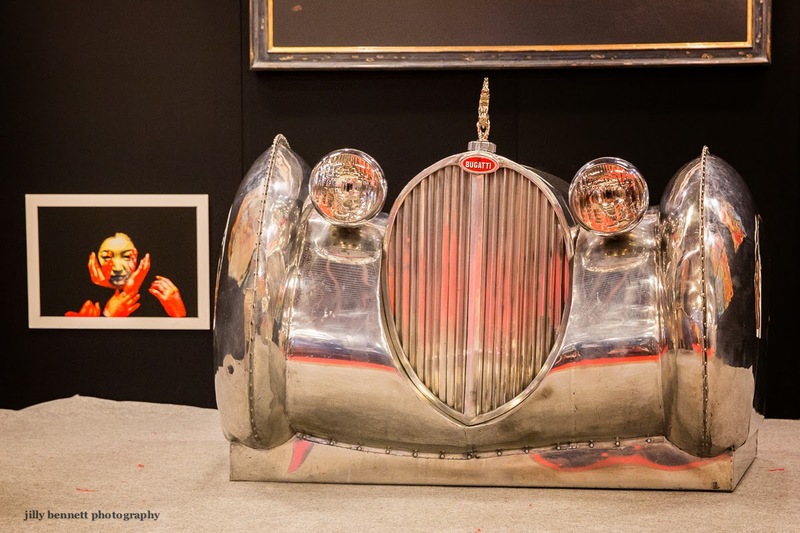 We're back at Art Monaco today - just for a few days - and then we have the Historique Grand Prix to look forward to. This is Norelkys (Noor) Blazekovic, a wonderfully dynamic lady, originally from Venezuela and now living and working in Miami, Florida. 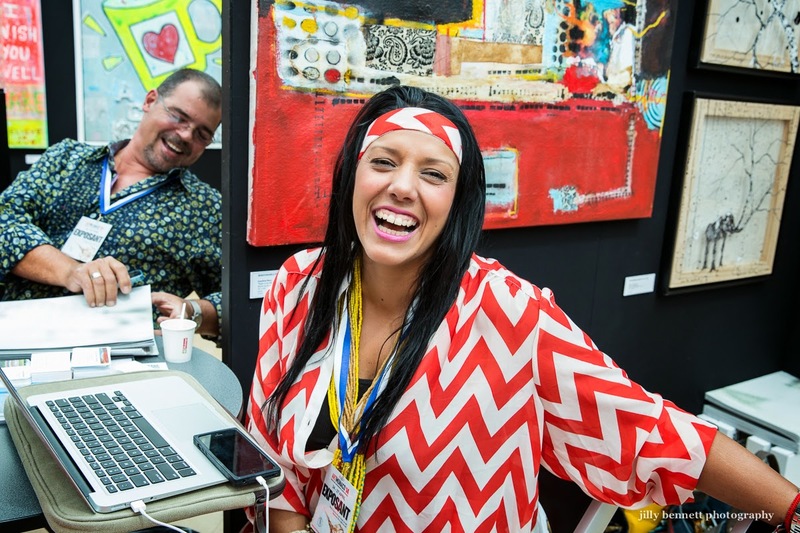 She was at Art Monaco with a group of artists she promotes as part of 'Irreversible Projects' - you can read more by clicking on the link. 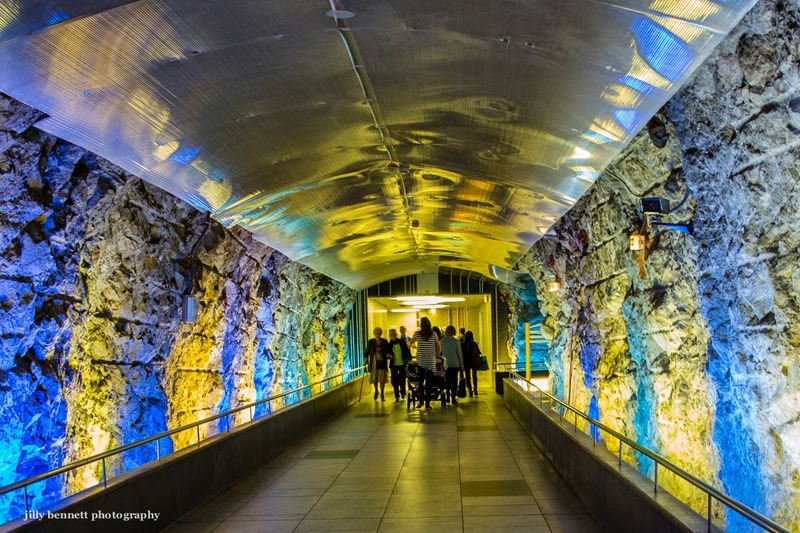 See the work of some of her artists tomorrow. One of Monaco's lady bikers. LOVE that jacket! 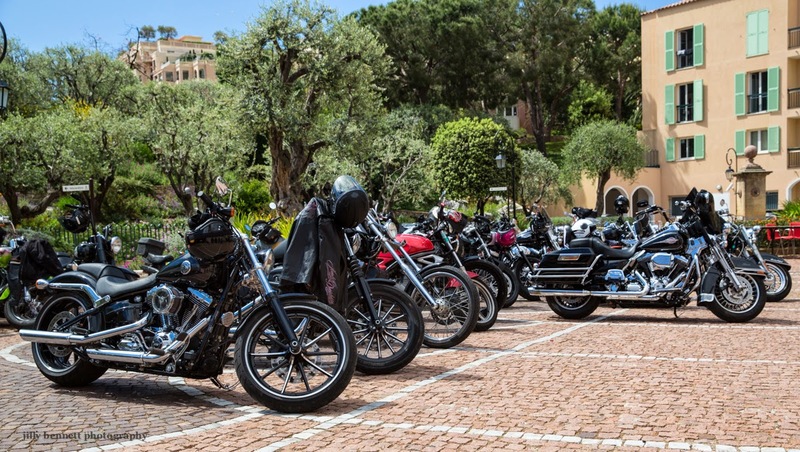 In the small photo some of the Harley-Davidson's parked outside Saint Nicolas Church in Fontvieille. Fontvieille's beautiful St. Nicolas' church as you won't often see it - surrounded by bikers and their beautiful Harley-Davidson bikes - see yesterday's post. Happily the sun came out in time for their barbecue. 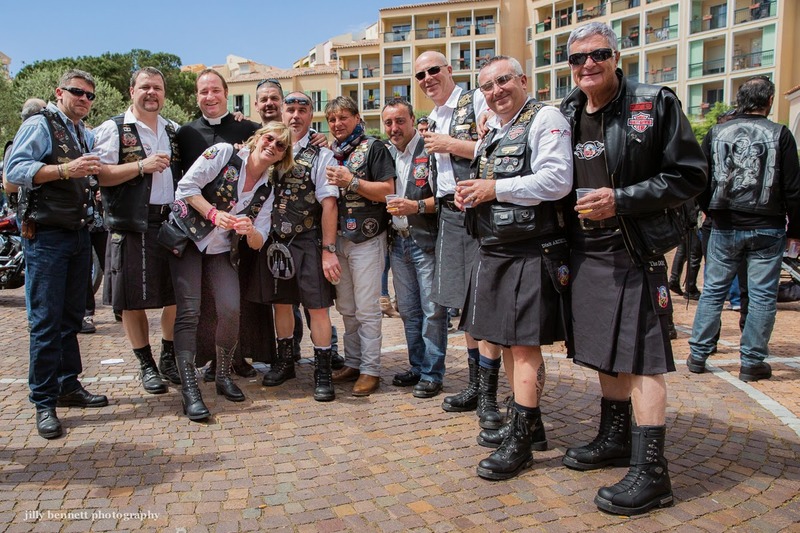 Father Julien, the priest of Saint Nicolas' church in Fontvieille, Monaco is a biker - a member of the Monaco Harley-Davidson Club. 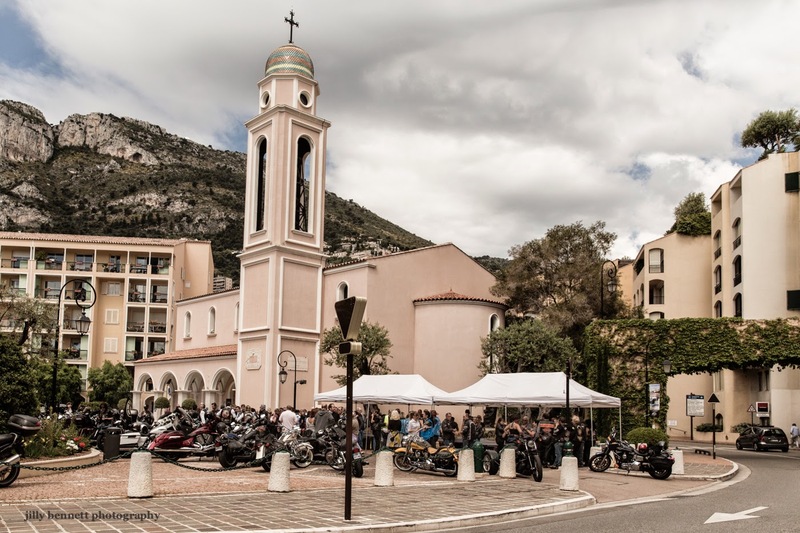 Each year he gives a service in the church for the bikers of the region - Monaco, France and Italy - and after the service there is a massive barbecue held outside the church. In this photo you see Father Julien third from left. 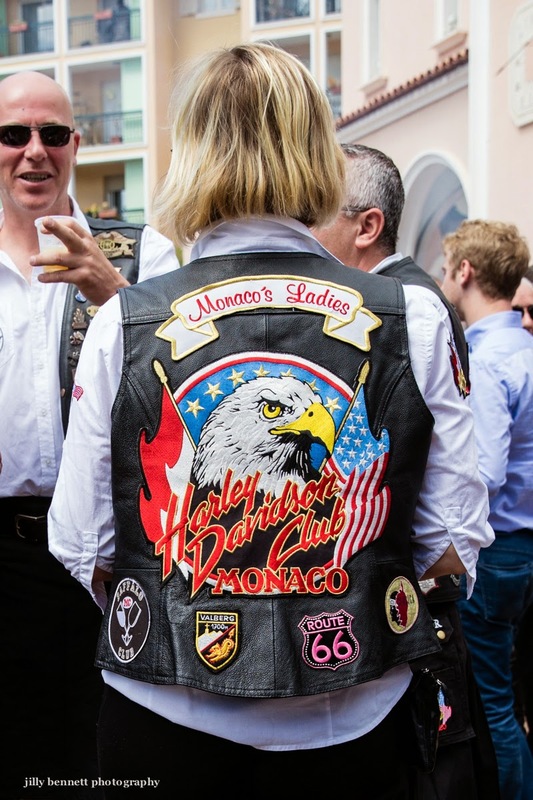 Who knew there was a Harley-Davidson club in Monaco? Who knew Monaco has a biker priest? I love it! Come back tomorrow - of course you want to see the bikes! And more bikers. 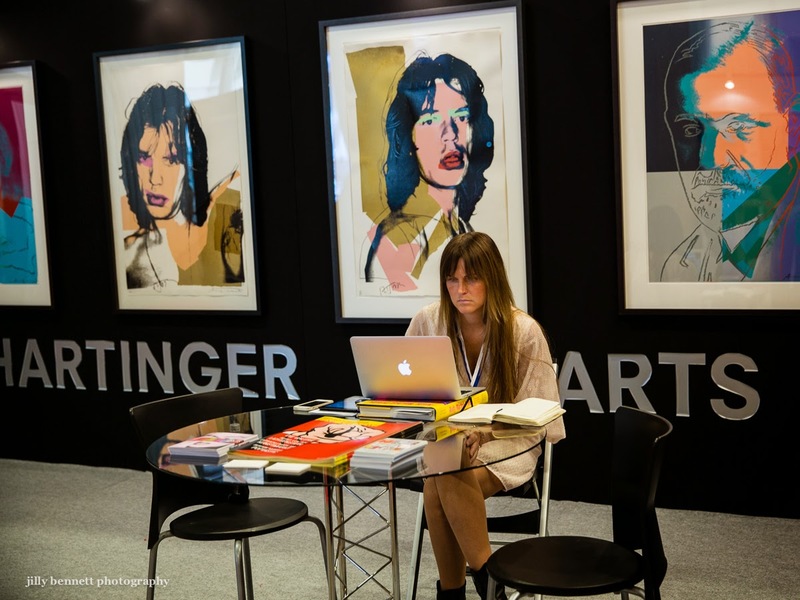 Art Monaco will return in a few days. You want a sculpture decorated with sharkshin, buttons and lace? Look no further. 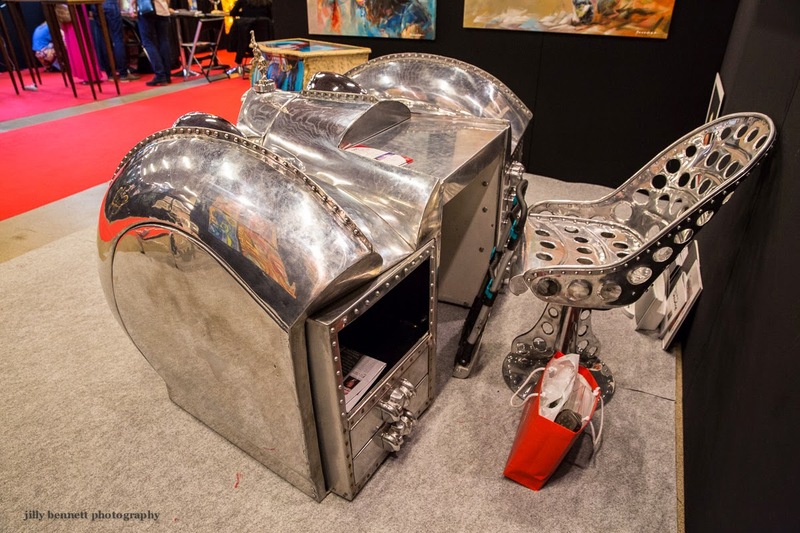 Sculptor, Bianca Tosti sells her art through Galerie Arista in Cannes.